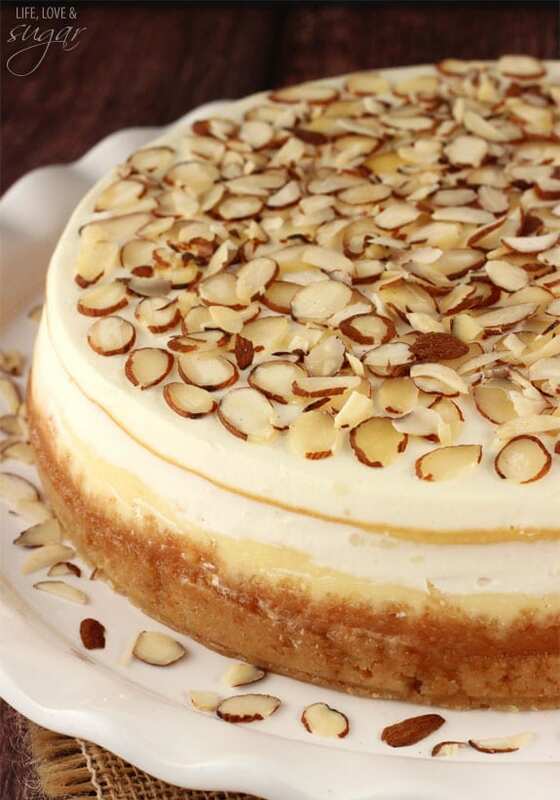 This Amaretto Cheesecake is the bee’s knees. 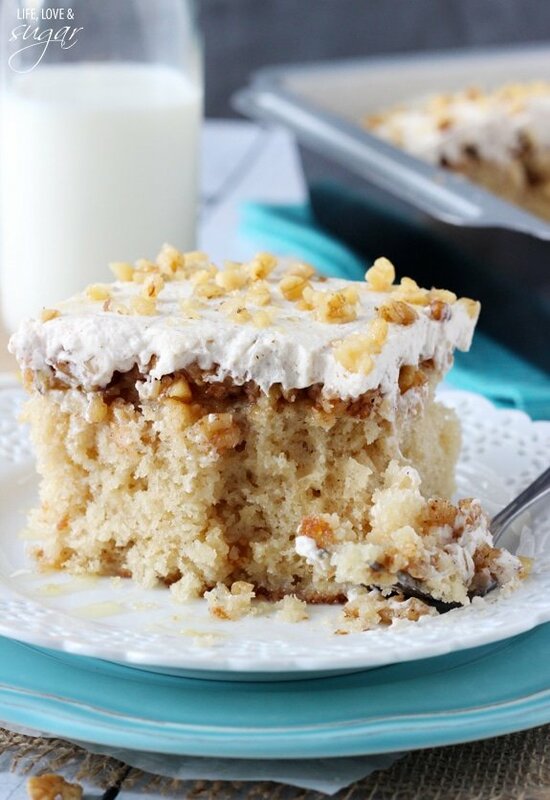 It is thick, creamy and full of Amaretto flavor, and it was a massive hit! I did not want to stop eating it. So about a week ago, I told you about my trip to the ALDI test kitchen in Illinois. We tasted all kinds of awesome food, and we also got a bit of a wine education from certified Sommelier, Leslee Miller. This girl knows her stuff! We got to taste all kinds of wine and learn about the right ways to taste them and how to pair them with foods. Being that I am not a huge wine drinker (I stick to the sweet stuff), it was a big learning experience and it was pretty interesting. Given my inclination towards sweet, I’m a New World wine kinda gal. We also went over some criteria used to test wine – sight, smell, and taste. Did you know that if you tip your glass of wine to a 45 degree angle and look at the edges of the wine, the color of it indicates its age? For white wines a lighter, clearer edge means it’s a younger wine. For red wines, they generally grow lighter with age, so a dark edge would mean a younger wine. Who knew?! As for smell, when smelling a wine you want to put your whole nose in the bowl of the glass. Smell in 90% of taste. One thing that I found particularly interesting was that wines are meant to be drank out of certain shaped wine glasses. There was one wine we tried in both bowl types and it was amazing how when it was in the wrong glass, it actually smelled and tasted terrible. And in the correct glass, it was great! I never would’ve known that was even a thing. So cool! They brought out an Amaretto cheesecake to go with this Moiselle Pink Moscato. You guys…I died. And went to heaven. They were both delicious. And together they were even better. For tasting the food and wines together, we were instructed to leave some food on our tongue, then sip the wine and let the flavors come together. 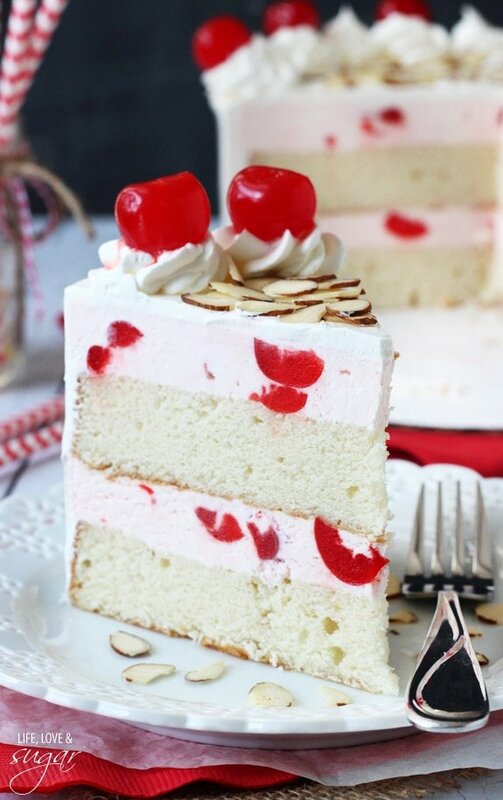 When we did this with the Amaretto cheesecake and Moscato, it tasted like you were eating a cherry. It was insane. And so stinking good. This cheesecake is absolutely amazing. Like seriously. Even you chocolate lovers won’t be able to resist it. It’s that good. 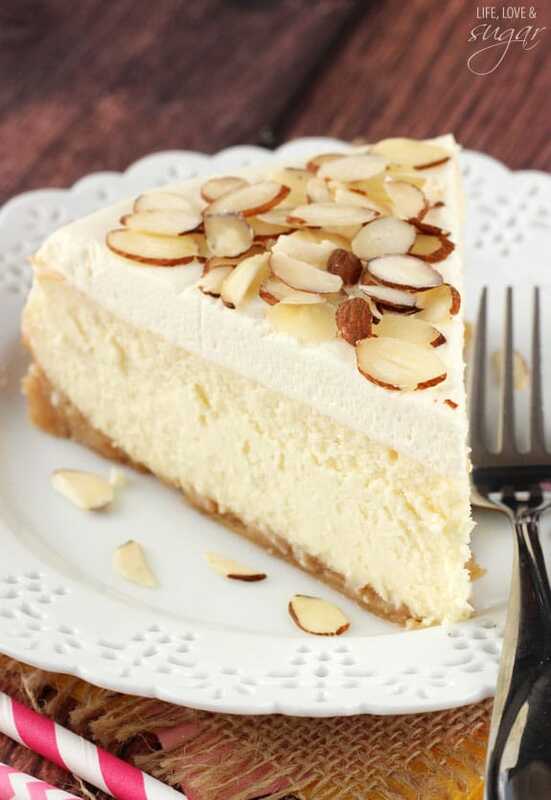 Of course I used the real stuff in this cheesecake – Amaretto all the way. But you could substitute for a creamer, if you’d rather it be alcohol free. I know cheesecake can seem intimidating, but it really isn’t hard. There are just a few things to remember. 1. 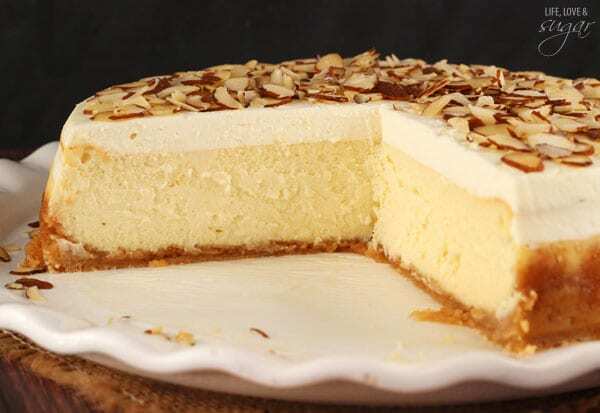 Don’t beat the cheesecake at high speeds or too much – it’ll add air into the batter, which can cause cracks. This is why it’s important to have room temperature, softened cream cheese. The softer the cream cheese, the less beating necessary. 2. Don’t over-bake the cheesecake. It’s done baking when there’s still about a 3 inch ring in the middle that looks a little undercooked. 3. Cooling. You want to do it slowly, per the directions below. 4. A water bath. I don’t love them, but they are necessary for a nice-looking cheesecake. And now you’re ready to go get your cheesecake on! Happy Eating! 1. 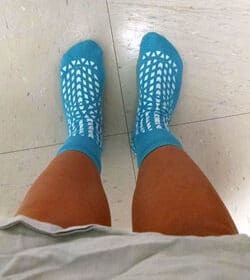 Preheat oven to 325°F (163°C). 4. Add the sour cream, almond extract and amaretto liqueur. Beat on low speed until well combined. 8. Bake for 1 hour and 40-50 minutes. 9. Turn off heat and leave cheesecake in oven with door closed for 10 minutes. 1. When cheesecake has chilled and is firm, make mousse topping. Add heavy whipping cream, powdered sugar and amaretto to mixing bowl and whip until stiff peaks form, for a total whipping time of about 5-7 minutes. 2. Set whipped cream aside and in another bowl, beat cream cheese until smooth. 3. Fold whipped cream into cream cheese until well combined. 4. Remove cheesecake from springform pan, then top with mousse. 5. 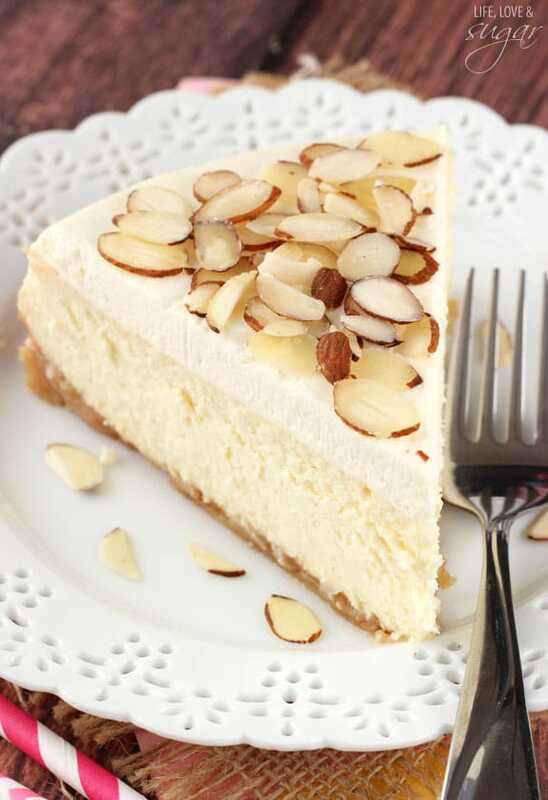 Sprinkle cheesecake with sliced almonds and store in refrigerator until ready to serve. 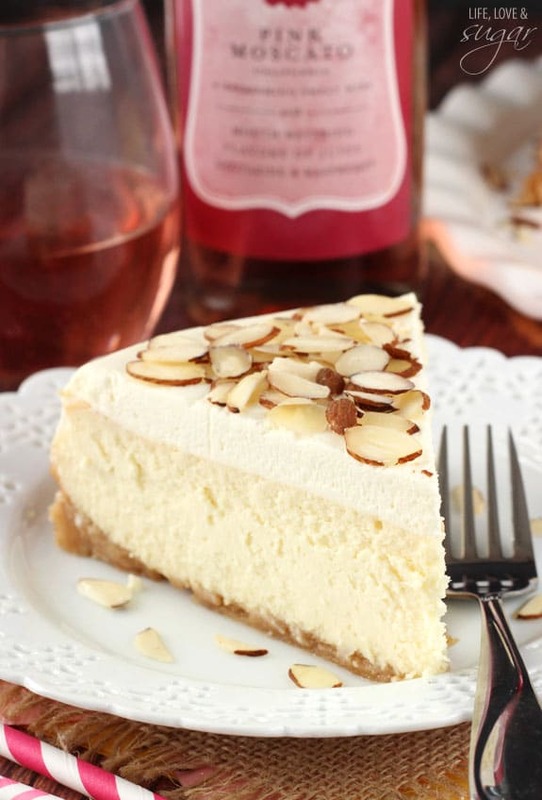 I really want to hunker down with a bottle of that Moscato and about half the cheesecake. That sounds like a really good Thanksgiving to me! I love amaretto anything. This is fantastic! Now THIS is cheesecake! It is so amazing! this looks awesome! I love cheesecake! 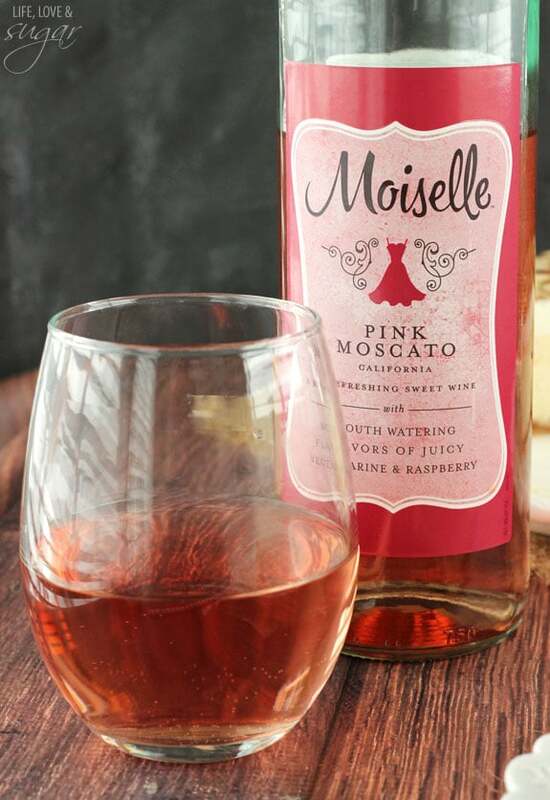 I’m totally a sweet wine girl too and that pink moscato is one I need to try. I can’t get over the cheesecake! 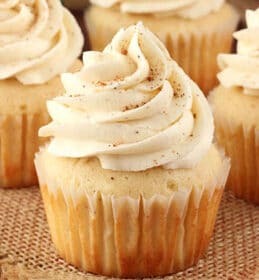 Amaretto is my absolute favorite, definitely making this over the holidays! OMG this cheesecake sounds so amazing! And I’m a huge fan of Moscato, I need to try this combo asap! Fantastic! 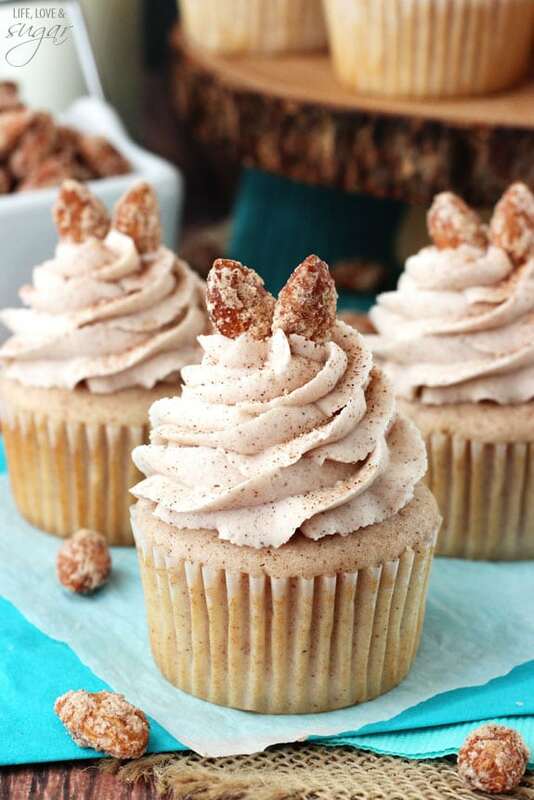 I love baking and cooking with amaretto. 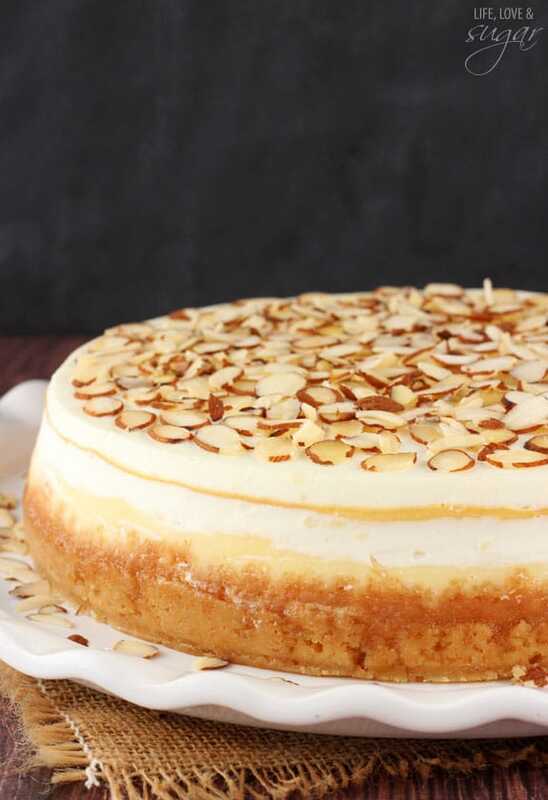 I have made an amaretto cheesecake before but it’s been a long time. 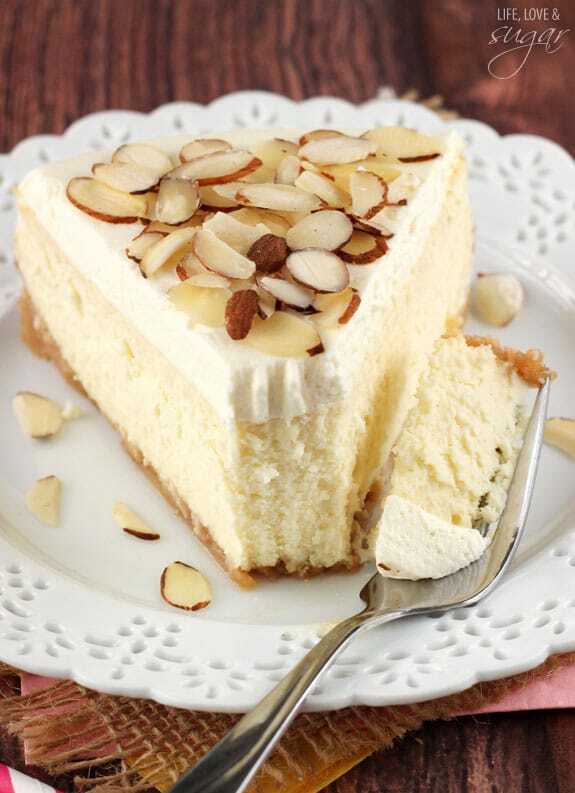 Love all the sliced almonds on top. 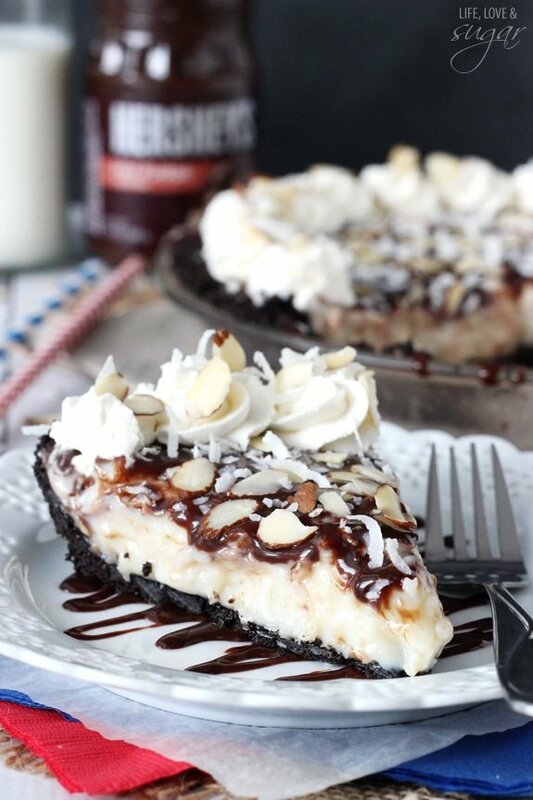 This looks so good, but I”m not going to lie, cheesecake intimidates me! 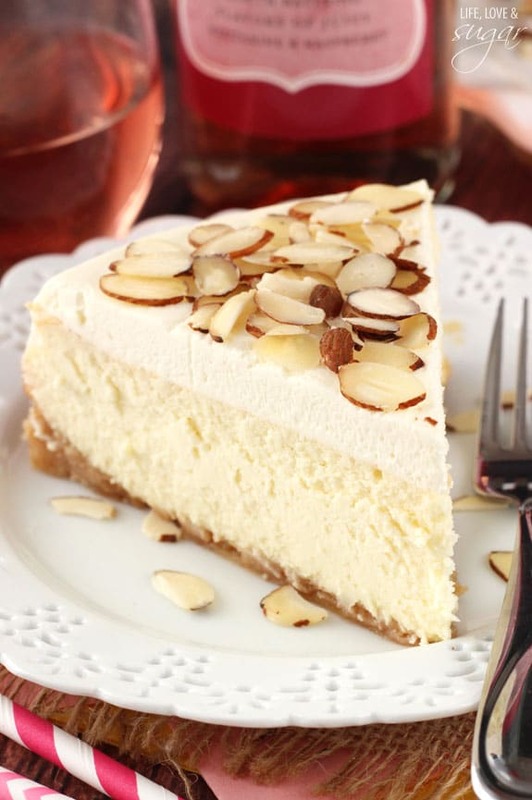 I am crazy about amaretto so I know that I would LOVE this cheesecake. Totally craving a slice right now! Is there a way to substitute the amaretto liquor? I know it probably won’t taste the exact same without it. Or will the alcohol completely cook out? I don’t know if it completely cooks out or not. You could substitute the liquor with an amaretto flavored coffee creamer. The end result might not have as strong of an amaretto flavor, but it would work. I made this last night for Valentine’s Day, and it was absolutely delicious! I love the almond flavoring to it. My boyfriend and I are saying this recipe is a keeper in our household. It does taste better the next day, it’s firmer and a lot creamier. Thank you for a great recipe!! I’m so glad you enjoyed it! Thanks Mariya! If you ever have a magazine, I would subscribe in a minute! I baked this cheesecake for Mother’s Day and it was quite the hit with my mum and family. Thank you for all the tips for keeping the cheesecake from cracking, it worked perfectly! In the ingredients, it lists amaretto, and later amaretto liqueur…is there a difference between the two, or am I supposed to use amaretto liqueur for both? I’m sorry that was confusing, they are the same thing. If I’m using a 6″ diameter springform pan how would I adjust the baking time? I haven’t tried it, so I can’t say for sure. You’d probably need to reduce the amount of batter, as well as the baking time. I’m curious, what kind of creamer do you suggest? I don’t drink alcohol or coffee! There should be several brands that have an amaretto flavor. Any of them should be fine. This was a really tasty cheesecake. It loses a point as the cooking time is way off. I cooked mine for an extra 5 minutes but it could have done with another 10 minutes. It’s quite an eggy cheesecake if you don’t chill it before you serve it so if you don’t have time then it’s better to make it the day before as mine tasted much better the next day. I didn’t put an extra amaretti biscuits on top as I thought it would be a bit dry. Also, the base is very thin. Next time I’ll add at least an extra 1 of each biscuit. Rich, creamy and very sweet. Took about 45mins to cook for me and i was also a bit worried it was too wobbly but it was fine. Actually tasted better the next day in my opinion so would make in advance if I make it again – which I am sure I will. I have a very good non-stick, leak-proof, springform pan. Would the parchment paper still be necessary? Also, Does this really cook for 1 hour and 40 to 50 minutes?? I use the parchment paper to help the cheesecake not stick to the pan. You can leave it out if you prefer. And yes, I cook this cheesecake for that long. It has a good bit of liquid. You could reduce it a bit if you wanted and has a little thinner filling. I tried this recipe and it came out really good. I made a few mistakes and yet it was still a very good cheesecake! I cooked it for one hour and 45 minutes which was about 5 minutes too long and my mousse topping could have been a little lighter, but next time it will be perfect. And there will definitely be a next time! 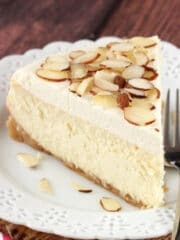 This is a delicious cheesecake and my family loved it. Thank you for this recipe. I’m not very clear on the crust. It calls for butter, but doesn’t specify which kind. Cold? Softened? Melted? You’re right. I’m sorry that wasn’t clear. I’ve updated the recipe. The butter should be melted. I made this cheesecake for the first time, and brought it into work . 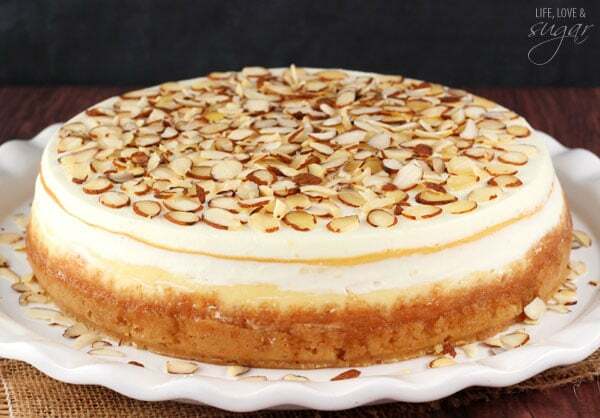 Everyone loved it, even people who do not normally like cheesecake. Although I am an avid and experienced baker, I have had less than great results with other cheesecake recipes that I have tried. This cheesecake turned out perfect, and was absolutely delicious. This cheesecake will definitely be on my holiday dessert table. Thanks for sharing the recipe. Really, really want to make this but I’m in the UK. Would you be able to convert the cups to grams for me? No problem, the recipe has been updated. Does the sour cream need to be room temp as well? Making this today for my husband’s birthday tomorrow. Thanks! I can’t wait to try this recipe. I hv made cheesecake before. Waterbath and no waterbath. I prefer no waterbath. My question is do I need to bake in waterbath? Thank you. I baked this and some of the water from the bain marie got ito the foil. Any tips on drying out tge crust which got a little soggy? I don’t have any real tricks, but the crust usually dries out a bit after you remove it from the pan and set it in the fridge overnight. Also, for the future, here’s a tutorial on how I avoid a leaking pan. I have tried your recipe. I L????ve!!! anything amaretto. I used amaretto syrup for the almond that’s how much I l??? ?ve it. Did the rest as you instructed. Waiting for it to get done in the oven. Will tomorrow go get the wine u mentioned for it. Can’t wait. Everyone suggest the next day to eat. I will give it it’s time to set up and marry. It will be hard but I want the greatest satisfaction for my tastebuds. THANK U!!! and again THANK U!!! You can put it directly into the fridge. But it also won’t hurt it to sit on the counter for a bit, if you need to do that. I am going to try this recipe. What kind of vanilla wafers do you use? Are they the Nilla wafer cookies or the long rectangular vanilla wafers that have cream in the middle or something else? They are the Nilla wafer cookies. I hope you enjoy it! I tried to make this with little success. To the person reasonable for the cooking and whipping times you should really look at them. This was the first cheese cake I had ever attempted. When I follow a receipt I assume all the times, temp’s and measurements are correct. So needless to say I cooked my first cheese cake for over an hour and a half and I’m sure you can guess how it came out. Other than that it had a great taste and I look forward to trying this again and not over cooking it next time. Hi David – everything is correct as written. Perhaps your oven temperature runs a little high? Also, did you happen to decide to not use the water bath? That would make a big difference to baking time and how the cheesecake turns out. Yes I did use the water bath and my oven temp was correct (I used a oven thermostat to make sure). I don’t have a window in my oven so I was relying on your times. When I checked my cheese cake at the hour and a half mark the top was burnt. I am trying this again tonight so cross your fingers and I will let you know how it comes out. Lindsay I can only give you 4 out of 5 stars because it took me 2 trys to get it right. I only cooked my cheese cake for about an hour at 300 degrees. I don’t know if it’s because I have a gas oven and you have an electric oven, but anyway it turned out great. I will use this receipt again in the future, but with my time corrections. I would like to thank you for this yummy receipt. Your recipe is perfect – no need to change a thing. The cooling instructions are just right in order to prevent cracking. I’ve made a lot of cheesecakes, but this one just looked flawless and tasted incredible. A huge success! I live at 6,800 feet and have had trouble making a decent cheesecake. I made this for my Supper Group and it was perfect! Creamy, no cracking on the top, and, oh, so rich! People thought it had been made professionally in a bakery. One tip about the water bath – put the cake pan into a slow cooker liner before wrapping it in tin foil as the tin foil can develop cracks, thus letting in water. It sounds like it’s fine, from what you’re describing.